Come and join Cat at the Flaming Centre in Bristol for a creative evening of yarn dyeing. In this 1.30 hour session, you’ll learn to dye your own skein of sock yarn in a relaxed environment. 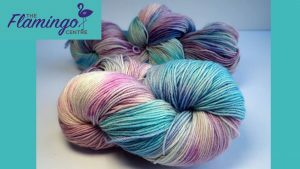 Dye your own yarn is suitable for absolute beginners, but if you have any questions or want to make sure this is the creative session for you, please don’t hesitate to get in touch via the contact details at the bottom of this event listing. You will be provided with a 100g sock yarn skein and dyes to make the mst of this creative evening. There will be cake and hot drinks (please send Cat any diet requirement before attending), and blank undyed yarn will be available to purchase separately on the night should you wish to continue your experiments at home! We reserve the right to cancel or postpone this workshop. In cases of unforeseeable circumstances like extreme weather, we will give as much notice as possible. If the event is cancelled or postponed due to low ticket sales, we will give a minimum of 1 day notice. In either case, anyone who was purchased will be offered a ticket for a further date.